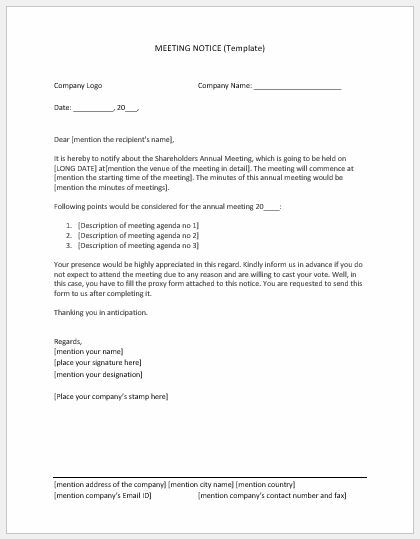 The meeting notice is used in different organizations. All the details related to the meeting are provided to each and every person who is to attend the meeting through this meeting notice. Whenever the manager or any stack holder wants to organize the meeting, he or she provides the details to all the attendees so that they can prepare their basic points that they want to be discussed in the meeting. In other words, the information about the meeting becomes official when you send it through a notice. The meeting includes the details such as the date on which meeting will be held, agenda of the meeting and a lot of other details. By writing a meeting notice to your staff members, you are behaving like a practical and a professional person. When to use the meeting notice? When you want to notify every one of the location, time, date and agenda of the meeting. No matter at which designation you are working, it is always necessary to inform others about the meeting that you have organized. A meeting is usually announced to discuss some important matters. Some meetings are also conducted to discuss some unexpected issues. The purpose of meeting notice is to inform everyone so that they prepare meeting minutes. Although the meeting notice is a professionally used document and it should be written concisely, you can enlist several points needed to be discussed in the meeting. Apart from agenda, the special instruction can also be added to the meeting notice if necessary. What are the key elements of meeting notice? The template for meeting notice can be downloaded from this website. It is a professionally designed template that contains all the necessary details. You can use it easily by customising. It is hereby to notify about the Shareholders Annual Meeting, which is going to be held on [LONG DATE] at[mention the venue of the meeting in detail]. The meeting will commence at [mention the starting time of the meeting]. The minutes of this annual meeting would be [mention the minutes of meetings]. Your presence would be highly appreciated in this regard. Kindly inform us in advance if you do not expect to attend the meeting due to any reason and are willing to cast your vote. Well, in this case, you have to fill the proxy form attached to this notice. You are requested to send this form to us after completing it.